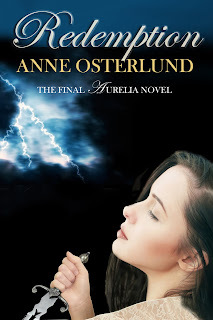 Redemption by Anne Osterlund: Character Interview and Promo! AURELIA, former crown princess of Tyralt, has cobbled together a new life in exile with ROBERT, the young countryman who loves her. In the Outer Realms, they have found safety, but their homeland has not. Tyralt is under attack. When a friend from the past arrives to persuade Aurelia to rescue her country, she and Robert must weigh the hopes of a kingdom against their own failures, nightmares, and self-doubt. Because both Aurelia and Robert know that if they make the wrong choice, with the freedom of an entire nation at stake, they may not find redemption. “Come on, Aurelia. It’s time to go to Live to Read!” I call to the heroine of my first complete series. She is hovering at the top of the stairs. She has actually been dressed and ready for the first stop of our blog tour—in honor of REDEMPTION, the third & final novel of the Aurelia Trilogy—since about 4:00 a.m. Aurelia is the only participant in the tour who is a morning person. Though if you ask her, she will probably tell you she has been prepared for her own personal blog tour her entire life. Robert is more nervous. He isn’t as used to the public spotlight. Four years on the frontier will do that to you. Though you would think he would have adjusted by now, seeing as how this is his third novel alongside a young woman raised as a crown princess. It takes as much backbone for him to stand up to Aurelia as it does for her to stand up to an assassin. Truly, I think both my hero and heroine have a lot of guts. Though their dynamic can be a challenge on a daily basis. I glance down the stairs. He is tying his boots. New boots. He really needed them. We all did. After our trek across the desert, over the frontier, climbing the treacherous Gate, negotiating the forest, and trying to survive the many battles within Redemption. “We’re going to be late,” Aurelia warns. You would think she might have become more patient after so much time around Robert. But some things don’t change. She descends the stairs and takes his hand, a sign that she is aware he isn’t just dawdling. Aurelia gnaws her lip. A rarity. To see her struggle to speak. She always has an opinion. But it’s a sign of how much this final book means to her. To us. Three years we spent writing this novel. Every line has come out. Only the vital ones went back in. And there were times—many—when we thought perhaps we would never reach the end of this journey. It’s been such an amazing, wonderful ride. Heart-breaking. Dream-making. Everything. We don’t regret it. Any of us. She’s nervous. We all are. We don’t know—any of us—if it’s the story our readers have imagined. Probably not. Probably some of it unfolds completely differently. And one day some of our readers will write their own stories to correct that grave injustice. But for Aurelia, Robert, and I it is . . .
“Everything,” we all say at once. Dogs and Their People Giveaway! Judith McNaught 14 Ebook Giveaway and Promo! Rachel by Caroline Clemmons: Promo and Giveaway! The Blockade by Jean Johnson: Giveaway and Promo! Saint's Row by Elizabeth Blair: Promo! Books I'm Excited For This Fall! A Date at the Altar by Cathy Maxwell: Promo!